Zacchaeus had a strong desire… do we??? 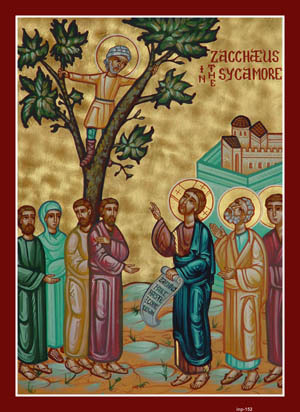 This past Sunday, we began the preparation period before Great Lent (referred to as the Triodion) with Zacchaeus Sunday. As we reflect on the Gospel reading, it focuses on Zacchaeus’ “desire” to see Christ – as a man of short stature, this desire led him to climb a tree. As we approach Stewardship, we also must ask ourselves what our desire is related to the support of our Church and the various ministries it is responsible for? St. Dorotheos of Gaza’s reflection on giving says… to bear one another’s burdens, to give alms and the like is well pleasing to God not when a man acts mercifully on account of some human consideration but because the act is good in itself… The thing is perfect when a man gives alms without meanness or reluctance, without despising the recipient… giving freely as if he were receiving, doing a kindness as graciously as if a kindness were shown to him. St. Nikolai Velimirovic says… He to whom material wealth is given, and shows himself to be selfish, hard, proud, merciless and godless, to him spiritual wealth cannot be given. Our Stewardship is a reflection of our spirituality and faith and as we begin to prepare for Great Lent, let us reflect on our Time, Talents and Treasures and identify areas where we can “give freely” to support of Church.